Hours: 8:00 a.m.- 3:30 p.m.
Tent camping at Hawaii State parks on Oahu is permitted, self-contained mobile campers are not permitted. Campgrounds are open Friday through Tuesday nights, camping is not permitted on Wednesday and Thursday nights. Tent camping at Sand Island State Recreation Park is permitted on weekends only, Friday, Saturday and Sunday nights. Camping permits are required, applicants must be age 18 or older. Permit applications may be made in writing, by phone, or in person, and must be received at least 7 days before the scheduled camping date and permits cannot be issued no earlier than 1 year in advance. The maximum stay per permit at any one park is 5 consecutive nights. 30 days must expire before reapplying for a new camping permit for the same park. Campsites are distributed on a first come/first served basis. Cabins are not availible in Oahu's state parks but beach houses are available at Malaekahana State Park, see below for more information. Tent camping at Honolulu county parks on Oahu is permitted, self-contained mobile campers are allowed only at certain parks. Campgrounds are open Friday 8:00 a.m. through Wednesday 8:00 a.m., camping is not permitted on Wednesday and Thursday nights. Applicants must apply in person at either the above office or a Satellite City Hall office. Permits will be issued up to two weeks in advance of the scheduled camping date. Applications for permits will not be processed by mail. Each applicant is limited to one permit for a maximum of ten persons, which includes children, 2 family sized tents, and 3 cars. Permits and tent camping are free. Camping is permitted at designated campsites only. In some camping locations numbered campsites are assigned, while other campsites are on a first come/first served space available basis. Cabins rentals are not available at county facilities. Scenic wildland valley. Swimming, bodysurfing, beach-related activities, picnic areas, camping and viewing of Huilua Fishpond at beach area. Hardy family hike (4.9 miles) and fruit picking in lushly vegetated forest; picnicking in coconut grove; pig hunting in public hunting area. Park open during daylight hours. Off Kamehameha Highway (Highway 83), Malaekahana Beach: Kalanai Point Section 0.6 mile north of La'ie town; Kahuku Section 1.3 miles north of La'ie town. Malaekahana State Recreation Area is a wooded beach park with swimming, bodysurfing, beach-related activities and surf fishing. Picnic areas and camping at Kalanai Point Section. Picnic, lodging and fee camping at Kahuku section--call 293-1736 for lodging and camping reservations. Park hours (see note). 40-acre wooded campground on one of the most beautiful beach parks on Oahu. 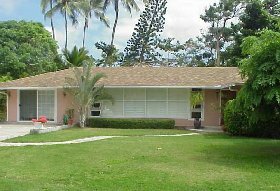 A premier gated property operated by a Hawaiian based, non-profit organization. One of the safest campgrounds on Oahu (security guard on premises) and one of the few open seven days per week. Tent camping is permitted, self-contained mobile campers are not permitted. Flush toilets, hot water outdoor showers. Rates: $5 per person per night (children under age 8 are free). 2 self-sufficient tent trailers (everything but bathroom facilities). Rates: $45 per night per trailer (sleeps 6). 7 beach houses, built in the 1940's, ranging in size from 2-bdrm/1 bath (600 sq. ft.) to 5-bdrm/3 bath (5,000 sq. ft.) accommodating from 8 to 20 people. They are clean, fully furnished (good furniture, excellent mattresses) with complete kitchens (some with microwaves). Guests must bring their own cooking and eating utensils and all linens and towels. No pool, no TV, no phone - only the sound of the surf to distract you! Very popular, booked up to one year in advance. Rates: $66 to $250 per night per beach house. Note: 2-night mininum stay required for all above lodging - 50% deposit to hold reservations. (One night tent camping is allowed on a space available basis.) For more information, please contact Friends of Malaekahana. Bellows has 50 campsites located along a beautiful sandy beach. The beach park offer the following ammenities; comfort station, lifeguard, public phones, picnic area, fishing, surfing, body surfing, swimming. Tent camping on weekends only (Friday, Saturday and Sunday nights). Hauula has 15 campsites, and such ammenities as a comfort station, public phones, picnic area, snorkeling, surfing, swimming. The Botanical is 400 acres of exotic plants and tropical foliage located at the base of the Koolau mountains. Special emphasis is placed on conserving plants native to Hawaii. Excellent hiking trails are availible. Tent camping on weekends only, Friday, Saturday and Sunday nights. Gate hours: 9 a.m. to 4 p.m. All permits must be validated at the Hoomaluhia Visitor Center. Kokololio Beach Park has5 campsites located on a shaded site on a beautiful white sand beach. Ammenities are; comfort station, picnic area. Beachcombing is popular, surf fishing, body surfing, swimming (hazardous conditions October - April). No camping Wednesday and Thursday nights. Campsite can be reserved. Gate hours: 7:00 a.m. to 8:00 p.m.
Kualoa offers campers 30 campsites. Located on the Kaneohe Bay peninsula, overlooking Mokolii Island, better known as Chinaman's Hat. The park has a great historical past in Hawaiian Culture. ammenities; comfort station, lifeguard, public phones, picnic area, night security, Diving & swimming. No camping on Wednesday and Thursday nights. Gate hours: 7:00 a.m. to 8:00 p.m.
Swanzy Beach Park has 12 campsites on a 5-acre site. Ammenities include; comfort station, public phones, picnic areas, diving, snorkeling, fishing, swimming when conditions are calm. The park's beach isn't very popular with swimmers due to a lack of a sandy beach. Camping allowed on weekends only, Friday, Saturday and Sunday nights. Waimanalo Bay Rec. Area provides campers with 10 campsites, with an ironwood forest, located on one of Oahu's finest beaches. Ammenities include; comfort station, lifeguard, public phones, picnic areas, night security, surfing, body surfing, and swimming. No camping Wednesday and Thursday nights. Gate hours: 7:00 a.m. - 7:45 p.m.
Waimanalo Beach Park has 23 campsites on 38 acres. This location is a very popular with local residents. Ammenities include; comfort station, lifeguard, public phones, picnic areas, snorkeling and swimming. The beach at Waimanalo is wide and sandy, making it ideal for families. Keaau privides campers with 55 campsites at this beach front camp location. Ammenities include; comfort station, public phones, picnic areas, diving, swimming (Hazardous surf conditions October - April). The shoreline and ocean bottom are rocky. There is a sandy beach at the west end of the park. Luakuakei Beach Park has 6 campsites. Ammenities include; comfort station, public phones, picnic areas. Diving, fishing, body surfing, swimming (Hazardous surf conditions October - March). Most of the shore is fronted by a coral reef and beach rock. No camping on Wednesday and Thursday nights. The camp area is only open in summer. The Nanakuli Beach Park offers campers 14 campsites. Ammenities include; comfort station, lifeguard, public phones, picnic areas, night security, diving, snorkeling, swimming (Surf conditions are usually caln in the summer months). Kaiaka Bay Beach Park has 7 campsites located on a peninsula in the town of Haleiwa with a rocky shoreline. Ammenities include; comfort station, public phones, picnic areas, night security, crabbing, fishing, swimming, throw netting. No camping Wednesday and Thursday nights. Gate hours: 7:00 a.m. to 6:45 p.m.
Mokuleia Beach Parkprovides campers with 15 campsites, on one of Oahu's most remote and uninhabited beaches. Ammenities include; comfort station, public phones, picnic areas, diving, surf fishing. Swimming conditions are hazardous October - April especially during big surf. 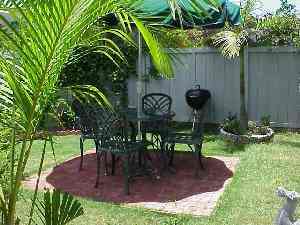 Cozy garden cottage that is a short walk to with fenced tropical garden area where you and cheery this garden hale has all of the necessities to make your stay in Kailua a memorable one! Amenities: Full Kitchen, Microwave, Air Conditioning, TV(Cable), Washer & Dryer, Linens Furnished, Grill, Telephone, Ceiling Fan, No Smoking, No Pets. Amenities: Jet Skiing, Swimming, Boating, Camping, Tennis, Restaurants, Hiking, Horseback Riding, Shopping, Theater, Fishing, Golf, Biking, Snorkeling. This private cottage is a quiet get-away where you can enjoy a short walk to the beach and watch the sunrise or sleep in late and listen to the morning doves. Kailua Beach awaits your arrival to enjoy many water sports or just sunbathe. This clean and bright property and friendly hosts await your arrival. Amenities: Tea Kitchen, Microwave, Air Conditioning, TV(Cable), VCR, Washer & Dryer, Linens Furnished, Stereo, Grill, Telephone, Ceiling Fan, No Smoking, No Pets, Private phone line and private entrance, Beach towels, Mats and chairs.